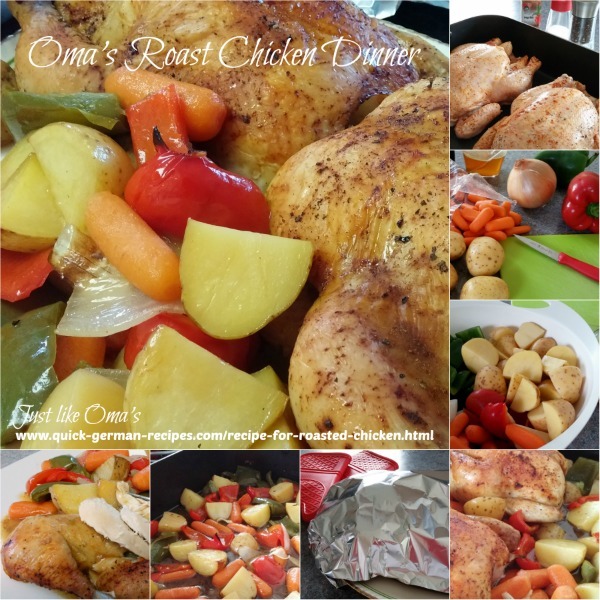 My easy recipe for roasted chicken dinner, aka Brathühnchen or Bavarian 'Brathendl', is so nice for a weekend dinner. Easy enough to throw together quickly and end up with a great meal. 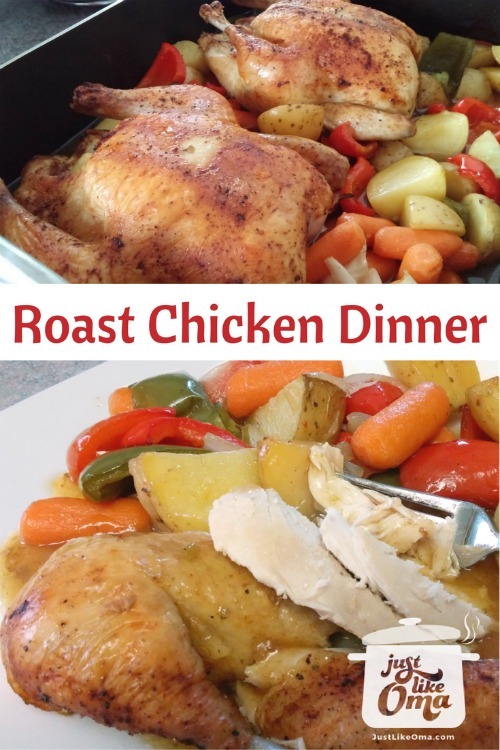 It's also a great way for beginners to learn how to roast chicken. Prepare the chicken, put into the pan, and into the oven. Then get the veggies ready and add them about halfway through the roasting time. Dinner's ready! A variety of vegetables can be used. I like using carrots, red and green peppers, potatoes, and onions. Zucchini are also a nice addition. So are parsnips. Be creative. 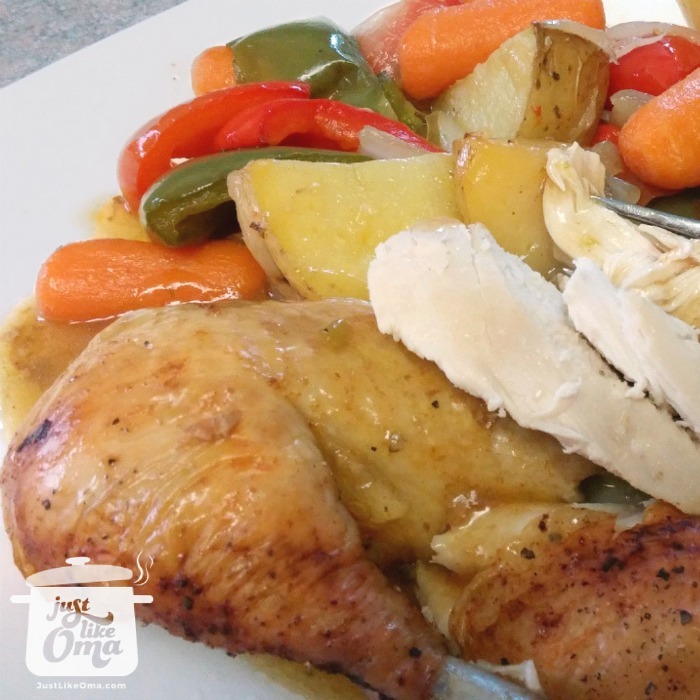 A different roast chicken dinner every time. Season chicken inside and out with salt, pepper, and paprika. Brush chicken with melted butter. Place parsley into chicken cavity. Place chicken into roasting pan and place, uncovered, in oven for about 30 minutes. During this time, prepare vegetables. Cut peppers into large chunks. Peel carrots and slice thickly (or use baby carrots). Peel potatoes (if desired. If not, scrub well) and cut into quarters. Peel onions and cut into wedges. Dissolve instant vegetable broth powder in 1 cup hot water. Strip rosemary leaves from stems. Once chicken has been roasting 30 minutes, add vegetables, broth, and rosemary. Roast for about another 60 minutes, uncovered, or until chicken is done. Occasionally, turn vegetables during roasting. If you wish, once the chicken is done, remove it and cover with foil to let it rest about 10 minutes. In the meantime, if the veggies aren't dark enough, just turn the oven to 450° F and continue to let them brown while the chicken rests. For the gravy, add about 1 - 2 Tbsp of cornstarch dissolved in a bit of cold water to the remaining liquid in the pan. Bring to boil (place the roasting pan on your stove burners) and stir until thickened. Season with salt and pepper if needed. Below, I put two chickens into the roasting pan. That crowded the veggies and they didn't cook completely (or get browned). So, once the chickens were done, I removed them, tented them with foil, and upped the oven temp to 450°F. The veggies finished within 10 minutes. Here I'm making 2 chickens. One for tonight, and one for extra meat for tomorrow. Then, bothl carcasses together into slow cooker for soup. Wunderbar! After that, I removed the veggies. I thickened the cooking liquid with a bit of cornstarch dissolved in water. Yummy gravy! When you buy chicken, you need to know what you will be using it for. If it's to make soup and broth, then almost any "old hen" will do. Usually they are sold as "stewing hens" and are mature female birds, weighing about 3 - 8 lbs. The meat will be tough, but the broth - yummy. For this roast chicken dinner, you want a young tender bird or a roasting chicken. 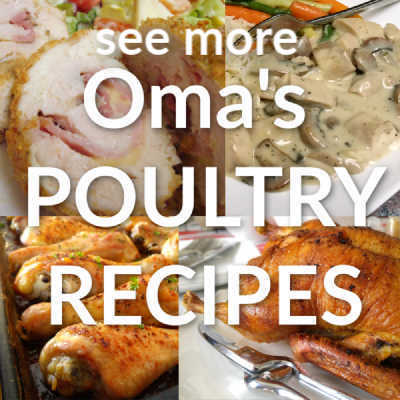 This recipe uses a bird that's about 3 lbs. "Listen to the words of the wise; apply your heart to my instruction. For it is good to keep these sayigs in your heart and always ready on your lips."